Please contact us for a mooring buoy quote. 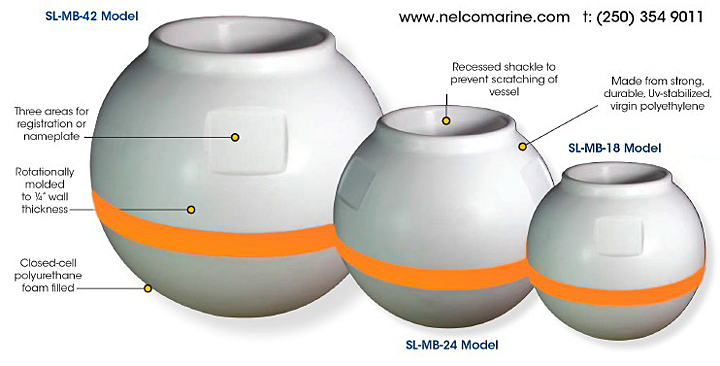 The Sealite range of Mooring Buoys are designed to offer customers long life and are suitable for a range of locations. This buoy has a unique recessed top section which allows connecting shackle to be protected from scratching the vessel. The innovative design of Ace Mooring Buoys is easy to recognize. 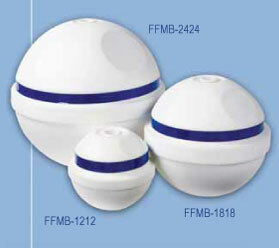 Designed to be durable and attractive, the buoys have several new features and can be personalized with little effort. Three flat spots on the top half of the buoy allow you to customize with graphics, numbers or reflectors. When you approach your personalized buoy, a molded-in plastic bumper protects both the buoy and reflective blue tape that makes Ace buoys stand out in the water. The tape stays smooth on its flat groove, right above the center bumper. The hard polyethylene shell has UV inhibitors to keep it looking new. Polystyrene foam fills the shell to provide maximum buoyancy. A PVC tube is molded through the center of the buoy to allow for different hardware options. 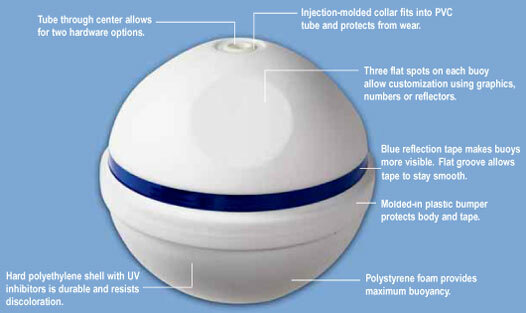 An injection-molded collar captures the tube on each end and protects the buoy from wear. Buoys can be used to mark waterways, can be rented to boaters mooring at your marina, or can be used to support the line to which you anchor your own watercraft. 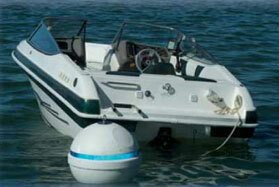 The buoys are also available without a bumper in the 32" x 38" & 42" sizes. 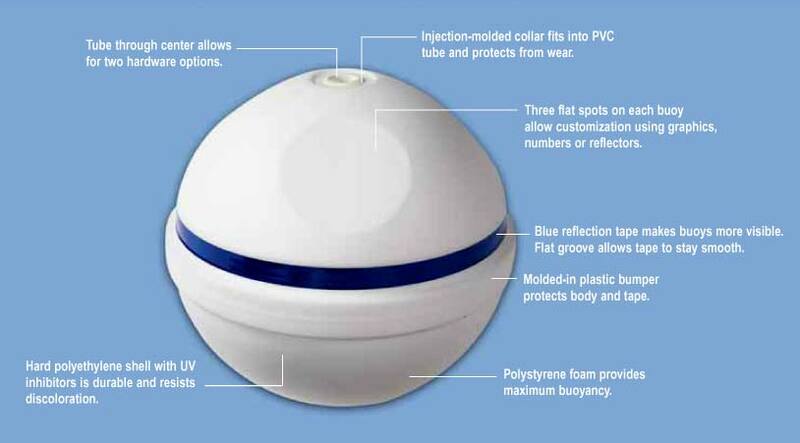 Why not choose a buoy that is durable, personal and eye-catching? Option 1 - Fixed Mooring Hardware Kit. This hardware kit captures the buoy on both ends and provides a swivel at the bottom for attachment of the anchor line. A loop is provided at the top for handling the buoy and storage of the watercraft pendant line on the buoy. Never anchor the watercraft directly to this loop. Watercraft must be anchored below the buoy and directly to the anchor line. 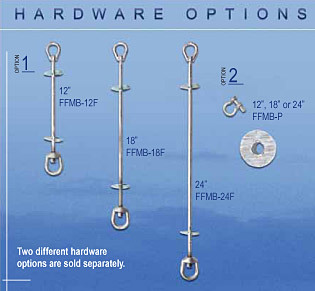 Option 2 - Pass-Through Mooring Hardware Kit. This hardware kit passes through the buoy center tube. The anchor line is attached directly to the line shackle. A bearing plate under the shackle prevents the shackle from passing through the buoy tube. 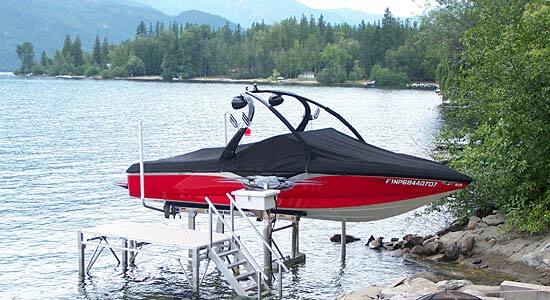 The watercraft's pendant line is fastened directly to the shackle.